The most common side effects of Benadryl are drowsiness and dizziness. Other common but harmless reactions to diphenhydramine medications like Benadryl include dry mouth, diarrhea or constipation, thick chest mucus and heartburn. Many of these side effects can be easily treated with adequate hydration or other medications. However, if you do experience any dangerous side effects such as hallucinations, seizures or ringing of the ears, you should contact your doctor immediately. The most common Benadryl side effects are typically harmless, though they may impact your regular routine. The most frequently reported side effect is drowsiness. This means that patients taking this medication should not drive or operate machinery while taking Benadryl. You may also have difficulty completing simple tasks associated with work, school or your daily routine due to the extreme sleepiness Benadryl causes in many people. These side effects are typically manageable. However, if you find your side effects having a significant impact on your daily life, worsening, persisting or becoming severe, you should talk to your healthcare provider immediately. 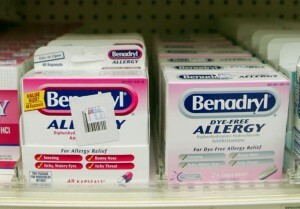 Some individuals may be allergic to Benadryl and other diphenhydramine products. If you experience any of the following side effects, you may be having an allergic reaction. If you believe this to be the case, you should contact your doctor immediately. Some side effects can be quite serious. If you experience any of the following side effects of Benadryl or diphenhydramine, you should contact your healthcare provider immediately. Many side effects are strikingly similar to the effects of alcohol, such as dizziness, drowsiness and trouble with coordination. It is generally advised that you avoid the use of alcohol while taking diphenhydramine medications. Drinking will only intensify the side effects of benadryl and may make it very difficult to function properly. Benadryl side effects do not usually prevent the patient from using this medication. Though it does cause extreme drowsiness for many people, this particular side effect may actually be beneficial if you are recovering from an allergic reaction, fighting off a cold or trying to make it through a car ride without motion sickness. When possible, take Benadryl or diphenhydramine at a time when you can rest, relax and recover and you should have very few difficulties with side effects.